I thought that was pretty good advice for all programming (but it does apply double to GIT). I just finished fixing a long-running bug in BrickSmith's culling code; this post is a review of ways to do mouse testing of a 3-d model. The mouse click is treated as a ray in normalized device coordinates (that is, it goes from Z=-1 to Z=1 at an X and Y that are proportional to the click on the viewport). The mouse click ray is transformed by the inverse of the model-view + projection matrices to get a test ray in model-view space. Each test triangle is forward transformed by its relative transformation before testing. The ray and triangle are tested via something like Möller-Trumbore. We need the depth of intersection to sort our hits, and we get that from the algorithm for free, which is nice. The algorithm forward transforms every triangle (sad) but it also does not have to calculate the inverse matrices of any of the sub-transforms of our model. Since LDraw sub-transforms can be pretty much anything in a 4x3 matrix, not having to run a real 'inverse' is nice. Because we aren't doing plane-based intersections or using matrix inverses, there is no need to cache any data to make the intersection tests faster. Since BrickSmith is an editor, not having to precompute 'helper' data for our model (that would need to be recalculated every time the user edits) is a win. There is no culling or early out; a hit test looks at pretty much the entire model, which is not fast. BrickSmith never shipped with a model-view-based approach to the marquee selection (which selects every triangle intersecting an axis-aligned bounding box (AABB) in screen space. Had we stayed with a modelview-space approach, I believe the marquee selection would have been implemented by taking the intersection of all triangles on the positive side of six planes: four planes going through the camera position and the selection box, as well as the near and far clip planes. In other words, the marquee selection forms a tighter-frustum in which we want to find intersections. If the frustum test is faster than our ray-triangle hit test (above), we can accelerate single-point testing by first culling the entire scene to a frustum that 'barely' surrounds our hit ray (e.g. via a marquee selection of just a few pixels). Since there was no marquee selection or fast frustum test in the original code, there was no utility to accelerate point testing or drawing. Mousing over very large models could be very slow (because the real-time coordinates-under-mouse display has to do a hit test to determine the depth under the cursor) and rendering very large models was slow even if they were mostly off screen. Point queries and AABB queries are always provided in normalized device coordinates (with returned depths also in NDC from -1 to 1). To test triangles, we forward transform them all the way through their complete matrix (model view and projection) and then do a perspective divide. The resulting primitive is 2-d in its extent and can be tested very cheaply. In particular, the AABB test is dirt cheap in 2-d.
We now have our frustum test and can thus rapidly reject things that are either off screen or far from our click point. To make things even faster, the code tests the AABB of containers of parts first (by trnasforming the AABB from its local model space to screen space, building a new AABB around it, and testing that). This hierarchical culling of bounding boxes is what provides the real speed. Given an MPD model with most of the sub-models off screen, we pay almost nothing for them. One more win: because the frustum surrounding a single mouse-click test is so tiny, almost everything in a model is rejected early when testing for the mouse, so mouse-over-the-model is fast even when a huge model is entirely on screen. At this point I was feeling pretty clever and smug (because for a really big model, the hierarchical culling could give you a 10x or 50x speedup) and happy (that my models were usable again). But of course if you have been working with 3-d graphics for a while, you're probably face-palming yourself at the big leak in the abstraction of working in clip space. Here's the thing: BrickSmith normally keeps your entire model behind the near clip plane. It's like your model is sitting on a table and you are hovering over it; you never actually jam your face into the model. So the fact that I was working in screen space was not a problem because the entire model always had a sane representation in clip space. Until it didn't. I implemented a "walk-through" camera that would let the user get inside their model and look around. For users making modular buildings, this leads to some pretty cool screen-shots. But it also led to low framerate and (even weirder) whole parts of the model just disappearing randomly! I looked at the math over and over and there just wasn't something broken. Of course what was broken was not a math mistake, it was a lack of clipping. The problem is that in screen space, geometry in front of the near clip plane is eliminated by the GPU; therefore we don't have to worry about the strange things that happen in front of the near clip plane. But in my hit-testing code, those vertices were being processed as is. At the near clip plane, geometry does not change size. In other words, you have a simple 2-d coordinate system. Behind the near clip plane, things get smaller as they get farther away - this is not astonishing. In front of the near clip plane, things get really big, really fast as we divide by a fractional Z. At Z = 0 (parallel to the camera) we get a divide-by-zero, which is exciting. Behind the camera, the divisor is negative (Z is positive, but the W coordinate has been negated already to get the rest of rendering to be not insane), so everything is mirrored in X and Y! So to review, we have INFs floating around our coordinates, some triangle vertices may have been mirrored around the origin, and some geometry might be scaled to be "freaking huge" if it's between the near clip plane and 0 in camera coordinates. The disappearing models happen when we have a model-view-space AABB that is to the left side of the screen in front of the camera and to the right behind the camera (because it is at a 45 degree angle to the eye-space Z axis, for example); in this case the "behind us" part of the AABB flips, and the whole AABB is to the left side of the screen in screen space and gets culled. The fix I found and implemented is stupid but effective: clip all transformed triangles in clip space before the perspective divide. The AABB is treated as a cube and each of its 12 edges are clipped to produce a new point set. Since the AABB was going to have a new AABB built around its 12 points, doing this with a clipped point set isn't much different. Triangles are clipped, sometimes resulting in zero or two triangles, before the perspective divide. Besides fixing mouse testing, this clipping improves rendering speed in walk-through views significantly: geometry that is fully behind the near clip plane is completely removed from consideration, even if its projection would be on-screen; similarly an AABB that is in front of us but off screen to the left and behind us directly is clipped and the AABB tightened to not contain a 'false intersection' in front of us. There were a few other options I considered but haven't had time to code. One option would be to do what X-Plane does (for culling) and work in eye-space, using side-of-plane tests for our frustum culling. The test (for points) is cheap and would work without clipping. Another option would be to work in homogeneous coordinates. I am still not sure if this is mathematically possible, but the idea would be to do the ray-point intersection in clip space, and then check whether the clip-space intersection is behind the near clip plane. This would let us do a single ray-triangle intersection without special-casing out the clipping logic, then reject a single point later. During the discussion, some developers brought up the question of occlusion culling. In many of these wide views, a fair amount of the geometry is going to have no contribution in the final image due to occlusion by other, closer bricks. Occlusion culling is tricky stuff. Occlusion queries on the GPU are not available to the CPU until drawing completes; recent GPUs are finally gaining the ability to use the occlusion query result directly, eliminating back-to-the-CPU latency. CPU-side occlusion queries are usually facilitated by heavy pre-processing of the source data, but that isn't an easy option in BrickSmith because it is an editor, not a viewer (and therefore the source data is continually changing). When looking at the algorithm that follows, please keep one thing in mind: the limiting factor here is vertex count - that's what we are trying to optimize. This is a very unusual situation in 3-d graphics; most systems are designed to not have this problem. In particular, we are not fill rate bound, so we can expect GPU commands involving small numbers of vertices to complete reasonably quickly, because the GPU isn't drowning in last-frames pixel-fill operations. We set up an off-screen render target so that we can get direct access to the depth buffer; we'll blit the whole thing down to screen later, and it'll be cheap (one single-pass screen-sized blit with no processing). We start drawing the way the engine works now: we traverse the data model and dynamically build instancing lists for all opaque parts. (Translucent parts get dumped in a holding bay for later, slower, sorted processing; they won't participate in occlusion.) This step exists in the current BrickSmith source code and is fast enough that CPU is not the bottleneck even on my older 2008 Mac Pro. We draw the instance list with the crude occluder meshes. This should, in theory, complete quickly, because the vertex count is low, early Z can take effect, there is no blending, and our shaders are not complicated. So far what we have basically done is rapidly put down a pre-Z style pass with some of our geometry. If our only goal was to limit fill rate, this would be a pretty good setup. But we need to eliminate actual drawing calls. Our next step is to grab the depth buffer and use render-to-texture to ping-pong it, forming a hierarchy of depth buffers. For each depth buffer we will use a "farthest" policy, so that a low-res depth texel contains the farthest depth of the four high-res depth texels that it covers. Now we can run GPU culling. For each instance list VBO, we run it through a geometry shader, treating one instance as one vertex. (In BrickSmith, instances are a 4x3 affine transform plus two RGBA colors, so our 20 floats can be five attributes in the vertex stream.) The geometry shader calculates the screen space AABB of the instance, fetches depth from the appropriate level of the Z buffer, and determines whether the brick's bounding box is clearly behind every single pixel already drawn into the AABB's location. The geometry shader then outputs zero or one vertices depending on the cull. The geometry shader must be fed into a transform feedback stage so that we can (1) capture the vertices back rather than render them and (2) so the GPU will retain the number of vertices for later use in a glDrawTransformFeedbackStreamInstanced call. Note that BrickSmith currently uses one giant VBO for its instance list - the individual bricks know which part of the instance list they own, so we save on VBO count. However, if we want to reduce the instance count we have a serious problem: our segment buffering will be borked. One way to solve this is to transform each primitive into its own transform feedback VBO, so that we can know how many primitives to draw and where they start. This would probably be bad for total draw performance. There are a few reasons why we can't actually ship this. The biggest single problem that I see is that the part library would have to be pre-tagged into rough occluder geometry and the rest. Given the size of the part library and its structure as a series of "subroutine"-style partial primitives, such a partitioning would both be a huge manual undertaking (that could in theory be automated) and it would result in a transformation of the parts that could not be fed back into the LDraw system. The code above assumes the most modern GPU features. Instanced transform feedback is an OpenGL 4.2 feature, so it would require a DX11-class GPU. Apple has not yet shipped OpenGL 4.0, so at best we'd be dropping support for Lion and Mountain Lion. Using separate VBOs for each brick (to get the cull list) would be a serious performance problem. It might be possible to overcome this with other new OpenGL techniques, but the requirement on a new driver would remain. GPU-culling could also be performed only on parts for which there was a large part count, applying an 80-20 rule to culling. Finally, the technique above is very complicated - it is probably more implementation work than the entire renderer-rewrite was, and BrickSmith is not a commercial project; those of us who poke at it do so in our very, very limited spare time. I don't thin anyone involved in the project has time for such serious GPU work. The conclusion is, of course, just to use crude reduced-LOD models for far viewing and go home happy. But having spent the time considering what it would take to do GPU culling, I figured I should at least write it down. First, a bunch of disclaimers: I do not know how the PowerVR SGX hardware really works, I do not have access to either the Apple OpenGL source or the PowerVR SGX driver source, and therefore what follows is all speculative engineering (read: guess work). So if what follows is wrong, you've been warned. With that out of the way, you're sitting in your office sipping iced coffee and coding OpenGL ES 2.0 subroutines for IOS. You test on the device and get an access violation with this back-trace. The question is: WTF? What does this mean? You look at your call to glBufferData and it looks (1) totally sane and (2) seems to have exploded on the 405th invocation. Why did it just stop working now? From what I can tell, you get an intentional crash in gpus_ReturnGuiltyForHardwareRestart when something goes wrong on the GPU itself, asynchronously, that the driver failed (or didn't bother) to catch. For example, if you are calling glDrawElements with VBOs bound for both the element array and all vertex buffer sources, then the draw call will be hardware accelerated*: the driver will write some commands to the command buffer to draw from addresses in the GPU address space (which I guess is just system memory for an iPhone) and the GPU will later read the command and start fetching elements. If you have screwed up and requested an element index that is out of bounds for the vertex arrays, the driver won't notice, because it is not copying your vertex data (and fortunately isn't wasting time bounds-checking your index buffer). Instead the GPU will eventually start fetching vertices directly, and when it notices that one of the vertex fetches went out of bounds, it's going to make a note for the driver to fetch later. So to sum up so far: you do a hardware-accelerated glDrawElements with bad index data (or the wrong VBO bound, or any other way to get out-of-bounds vertex fetches) and some time later the GPU gets around to executing your command (which has not been pre-checked), notes that it went out of bounds, and leaves a note for the driver to pick up. So now we can look at why we blew up in glBufferData, a seemingly unrelated call. glBufferData called into GLEngine (which is Apple's common OpenGL engine), which eventually had to talk to the specific PowerVR SGX driver. (Apple's OpenGL stack is made of a common front-end that Apple produces, and back-end drivers that talk to specific hardware.) The SGX driver at that point goes to talk to the hardware and discovers that since its last check, something really bad happened (E.g. we went out of bounds in our draw call). The SGX driver then calls Apple back, calling gpus_ReturnGuiltyForHardwareRestart, which I guess is Apple's way to have a GPU vendor's driver tell them that the GPU itself seg faulted. What makes these crashes exciting is their synchronous nature: the call that you get the crash in is (1) not the call that offended OpenGL and (2) affected by timing on both the CPU, and GPU (because the crash comes in the first CPU call to talk to the GPU after the GPU detects the problem, which happens whenever it has time to get to your draw call). So the normal technique (comment things out and see what changes) just moves the crash around. Based on this speculation, the way I fixed the problem was: I wrote a (very slow) debug routine to check the indices of all glDrawElements and glDrawArrays calls, mapping back the buffers as needed, and asserting that things are sane. This immediately caught our real problem: a client-array draw call was failing to unbind VBOs - by luck the call before had changed to leave a VBO bound. The client-array call was now drawing out of VBO memory, not its own, and since the VBO was smaller than the client array being specified, the draw call would run off the end of the VBO. Because we have macros that map all glDrawElements and glDrawArrays calls to our own routines (that then call the real glDrawElements and glDrawArrays calls) adding this error checking was quite trivial; why we have those macros will have to be another blog post. * Well, maybe it will be hardware accelerated. If you have poorly aligned vertex data or use a wonky format, you might fall back to software vertex transfer. This is fairly easily spotted in Instruments because your draw call will have routines with IMM below them in the trace, and a lot of CPU time will be spent immediately copying your vertices. Accelerated draw calls themselves take almost no time to execute other than time to update GL state (which is also usually visible in Instruments). You might think the primary purpose of X-Plane is to help people enjoy the experience of flight at home, or to help pilots train for real-world situations. You would be wrong. X-Plane's real purpose is to slowly drive the last traces of sanity out of OpenGL driver-writer's already deep-fried minds. X-Plane is joined in this noble calling by a legion of other sometimes-badly-behaved legacy applications that are shot through with conditional logic based on random OS and driver versions. applications set it or not. But hey, we tried. I would like to suggest to the ARB that, in the future, they name the hints things like GL_REALLY_FAST_BIT and GL_NO_REALLY_THIS_BUFFER_NEEDS_TO_BE_FAST_BIT. You guys are going to ignore the hint bits anyway; the hint bits might as well directly express what we are trying to code. I dropped X-Plane into ATIAMD's GPU PerfStudio 2 to see what might be going on on the GPU side of things. This is on a Sandy Bridge i5 with a 7970 on a 1920 x 1200 monitor. I cranked the sim up to 4x SSAA (stupidly simplistic anti-aliasing) to really push fill rate. We're mostly CPU bound. Still. You know those GDC talks where the first thing the IHVs say is "most games are CPU bound?" I can feel them glaring in my direction. There was one case where I was able to absolutely hose the GPU: a full screen of thick particle-type clouds at 1080p + with 4x SSAA. You can tell you're GPU bound just by the amount of heat the card blows out. What was cool though, was running a batch profile in GPU PerfStudio and sorting by GPU time. At a whopping, facemelting, eye bleeding 32 ms was a single batch of cloud puffs (about 10k vertices) that covered most of the screen. The histogram falls off from there, with the next few most expensive cloud batches taking a few ms and everything else being noise. I went looking for anything else that might be slow and finally got an answer about pre-stenciling lighting volumes. Our first deferred rendering implementation pre-stenciled lighting volumes to cut fill rate; we dropped the stencil pass when we found that we were CPU and AGP bandwidth bound; the only time losing stencil was a problem was in high-zoom lighting scenarios. With the GPU profiler, I could see that a moderate sized batch of light volumes around the Apron at our Seattle demo airport takes about 1.5 ms to render at the aforementioned rather large resolution. The scene has maybe 3 or 4 volumes of that magnitude, and the rest are small enough in screen space that we don't need to care. That only adds up to 6-10 ms of GPU time though - and given that the sun pass is fast enough to not show up in the top 10 list, FXAA is fast and even scenery fill isn't so bad, it's clear why light fill isn't the long pole, particularly when the CPU is struggling to get around the frame in 30 ms. Cutting CPU work does appear to be the right thing here. My next step will be to integrate the NV and ATI performance counter APIs directly into the sim. We have, at various times, had various timing utilities to allow us to rapidly instrument a code section in a way that follows the logical design, rather than just the call stack. (Shark was so good that we didn't use any utilities for a while.) With the GPU performance counters, we could potentially build HUD-style GPU metering directly into the app. So you want to draw a series of streaming 2-d quads. (By streaming I mean: their position or orientation is changing per frame.) Maybe it's your UI, maybe it is text, maybe it is some kind of 2-d game or particle system. What is the fastest way to draw them? For a desktop, one legitimate response might be "who cares"? Desktops are so fast now that it would be worth profiling naive code first to make sure optimization is warranted. For the iPhone, you probably still care. The first thing you'll need to do is to put all of your geometry in a single VBO, and reference only a single texture (e.g. a texture atlas). This is mandatory for any kind of good performance. The cost of changing the source buffer or texture (in terms of CPU time spent in the driver) is quite a bit larger than the time it takes to actually draw a single quad. If you can't draw in bulk, stop now - there's no point in optimizing anything else. When drawing a lot of stuff, uniforms are your friend; because they are known to be uniform for a single draw call, the driver can put them in memory on the GPU where they are quick to access over a huge number of triangles or quads. But when drawing a very small amount of geometry, the cost of changing the uniforms (more driver calls, more CPU time) begins to outweigh the benefit of having the GPU "do the math". In particular, if each quad has its own matrix stack in 2-d, you are saving 24 MADs per quad by requiring the driver to rebuild the current uniform state. (How much does that cost? A lot more than 24 MADs.) Even ignoring the uniforms, the fact that a uniform changed means each draw call can only draw 1 quad. Not fast. One simple option is to throw out hardware transform on the GPU and simply transform the vertices on the CPU before "pushing" them to the GPU. Since the geometry of the quads are changing per frame, you were going to have to send them to the GPU anyway. This technique has a few advantages and disadvantages. Win: You get all of your drawing in a single OpenGL draw call with a single VBO. So your driver time is going to be low and you're talking to the hardware efficiency. Win: This requires no newer GL 3.x/4.x kung fu. That's good if you're using OpenGL 2.0 ES on an iPhone, for example. Fail: You have to push every vertex every frame. That costs CPU and (on desktops) bus bandwidth. Not-total-fail: Once you commit to pushing everything every frame, the cost of varying UV maps in real-time has no penalty; and there isn't a bus to jam up on a mobile device. Note that if we were using naive transforms, we'd still have to "push" a 16-float uniform matrix to the card (plus a ton of overhead that goes with it), so 16 floats of 2-d coordinates plus texture is a wash. As a general rule I would say that if you are using uniforms to transform single primitives, try using the CPU instead. If you are on a desktop with a modern driver, you can in theory leverage the compute power of the GPU, cut down your bandwidth, and still avoid uniform-CPU-misery. Disclaimer: while we use instancing heavily in X-Plane, I have not tried this technique for 2-d quads. Per the first section, in X-Plane desktop we don't have any cases where we care enough. The streaming case was important for iPhone. Set the GPU up for vertex-array-divisor-style instancing. The mesh itself is a simple 4-vertex quad in a static VBO. You issue a single instanced draw call and the card "muxes" together the instancing transforms with the vertex data. You get a single batch, a small amount of data transferred over the bus, and low CPU use. There are other ways to instance using the primitive ID and UBOs or TBOs - YMMV. If you have no instancing, you can use immediate mode to push the transforms and make individual draw calls. This case will probably outperform uniforms, but probably not outperform streaming and CPU transform. You could use geometry shaders, but um, don't. Just a science experiment from the weekend. LDraw parts have been scaled to get them to all fit on screen together. I was flipping through MOC-train pictures and was struck by this image. What got my attention is not only that it is a very well done model, but also that it is one of the few images in the photo stream that really pops despite being a computer-graphics render (as opposed to a photo of a real lego set); most of the renderings don't have the same "ooh" factor as real models. I was able to get smooth shading working (more or less) in BrickSmith, at least as a prototype, and that got me thinking: what are we going to do with the new rendering engine? Now that we have shaders and smooth normals, what lighting would actually look good? The existing lighting model makes models look like a bit like instructions; it's great for clarity and editing without eye strain, but no one is going to think you're looking at a photo. Lego bricks have some kind of BDRF - they are highly reflective at some angles, and the reflection strength dies off with angle; the BDRF may be more complicated than a standard exponential specular hilite. Given the small number of part surfaces, it would not be insane to model each specific BDRF with a lookup table texture. Normal mapping: it turns out that a square brick doesn't actually have a flat side. There is a subtle bit of 'indent' in the center of the side relative to the corners. I don't know if this is intentional or a limit of the manufacturing process (I'll go with "intentional" since TLC is known for their insane levels of quality control) but there is no question that a flat surface is not actually flat. The amount of curvature depends on the part, and the shape of the curvature appears to have a pattern - the brick wall goes 'out' at the corner, creating tell-tale reflections just inside the bounds of the brick. This effect could potentially be created with texture-based normal mapping. The brick edges present a difficult problem; they are represented as line segments in LDraw (to make it easy to provide a wire-frame around bricks for instruction-style drawing). In a real lego model, the edges of the bricks appear to be slightly faceted, which makes them feel less sharp. This leads to two effects: specular hilites off the edge of the brick, and 'dark cracks' between bricks, which I would say is essentially self-shadowing or ambient occlusion. My thought is to set up the lines with the average normal of the 'crease' it represents and then use them to overpaint some specularity, but I haven't tried this yet. There is slight variation in the direction of the bricks - a modeler can assemble bricks with varying degrees of tightness, and if desired, can leave the bricks a little bit loose to get some variation in their exact orientation. This leads to variations in normals (and thus lighting) as well as self shadowing and more/less visible cracks at their junctions. My thinking is that this could be simulated by applying some tiny offset to the transform of individual bricks. While some POV-Ray style renders use cast shadows (including the one I linked to) I think that ambient occlusion might provide better lighting cues. People usually play with and observe legos indoors, and the indoor environment often has heavily diffused lighting. Lighting with screen space reflectance/ambient occlusion - that is, we walk the neighborhood around our pixel in screen space, capturing shadowing and local color bounce, and lookup the ray in the environment map for rays that escape. I will be the first to admit that I have no idea how a material BDRF, local screen space GI, and environment maps play together. Those questions may also be slightly moot; the LDraw data for parts does not contain normal maps or even surface roughness descriptions, so good input data on the lighting properties of the bricks might not even be available. But this is all walking before we crawl; smooth normals are not fully coded or debugged, the new renderer hasn't shipped yet, and I still don't have an LOD scheme to cut vertex count. I spent about three hours yesterday tracking down a weird bug in CGAL - I have code that builds a general polygon set out of an arrangement, exports the polygons, and weirdly the polygons had duplicate points. This is an impossibility for a valid arrangement. To my annoyance, I discovered today as I went to write the bug up that I knew about this bug...over three years ago. :-( I get annoyed when I search for the answer to an obscure OpenGL problem and find my own post (e.g. I'm not going to find anything I didn't already know), but it's even more annoying to waste hours on the bug and then have that happen. Remove redundant edges - the GPS code assumes that the arrangement doesn't have needless edges (which will screw up traversal). Fortunately, the GPS code has a utility to do this, which I just call. Then you have to ensure that the direction of the underlying curves along the various edges are consistent - that is, for a given counter-clockwise boundary, every underlying curve goes either with or against the edge. I wrote code to enforce this second condition by flipping the curve of any halfedge where (1) the curve goes against the halfedge and (2) the halfedge is adjacent to the "contained" side of the map. With this, polygon set operations work on arbitrary map input. Why Did You Try This? Sometimes the polygonal set data I want to process came from an arrangement, and that arrangement is fairly huge. Having to construct the arrangement out of polygons the normal way requires geometry tests - topology data would be lost and rediscovered. For big maps this is really performance-painful. I have some operations that work on arrangements that are precursors to boolean sets. For example, the airport surface area data are fundamentally polygon sets (e.g. in the set is the airport surface area) but some of the constructive processing (e.g. simplifying the contour) run on arrangements. When an arrangement is turned into a polygon set, one of the results is a rather drastic map cleaning. Since the polygon set cares only about containment (what points are in, what are out), random features like roads tend to get blown away. 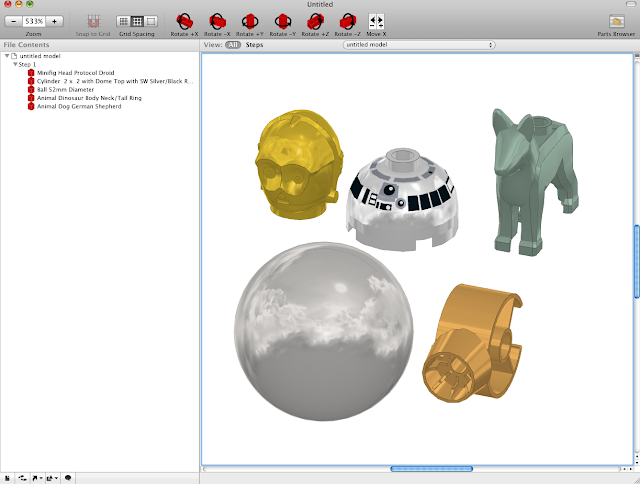 BrickSmith is a FOSS 3-d LDraw-compatible editor for Mac; basically it lets you model legos on your computer. BrickSmith is a wonderful program - really a joy to use. I have submitted a few patches, mostly little features that I want for my own modeling. Recently I rewrote the low level OpenGL drawing code to improve performance and quality; hopefully we'll ship this in the next major patch. This post describes the OpenGL techniques I picked. Since OpenGL is a cross-platform standard, it's possible that the design might be of interest (at least for reference) to other LDraw program developers. In some cases I will reference X-Plane performance numbers because I have access to that data. The file format effectively turns into something like a push-down state stack and individual line, tri, and quad primitives. The vast majority of drawing tends to be colored lines and polygons; while texture support was added to the format, it's not yet in wide-spread production. The new renderer uses shaders, not the fixed function pipeline. Because of this, I was able to program one or two LDraw-specific tricks into the shaders to avoid CPU work. The shaders understand the LDraw concept of a "current" color (which is the top of a stack of color changes induced by the inclusion of sub-parts/sub-models) vs static hard-coded colors; a given part might be a mix of "this is red" and "fill in the blank". I represent these meta-colors that come off the stack as special RGBA quadruples with A=0 and RGB having a special value; the shader can then pull off the current stack state and substitute it in. This is important because it means that I can use a single mesh (with color) for any given part regardless of color changes (the mesh doesn't have to be edited) and I don't have to draw the mesh in two batches (which would cost CPU time). BrickSmith "flattens" parts in the standard LDraw library into a single simple representation - in other words, the 'stack' is simulated and the final output is consolidated. Thus a part is typically a single set of tris, lines, and draws, all stored in a single VBO, with no state change. Thus the library parts are "atomic". The VBO is loaded as STATIC_DRAW (because it is virtually never changed) for maximum speed. Because LDraw models are currently flat shaded, BrickSmith does not attempt to index and share vertices; all VBOs are non-indexed, and a distinct set of GL_QUADS is maintained to avoid vertex duplication. Thus each time you 'touch' the matrix state, the entire set of built-in uniforms including the ones you haven't messed with (your projection matrix, lighting values, etc.) get copied into a new chunk of buffer that must be sent to the card. The driver doesn't know that you're only going to touch transform, so it can't be efficient. That uniform buffer will then either be in AGP memory (requiring the card to read over the PCIe bus at least at first to draw) or it will have to be DMAed into VRAM (requiring the card to set up, schedule, and wait for a DMA transfer). Either way, that's a lot of work to do per draw call, and it's going to limit the total number of draw calls we can have. Remember, 5000 draw calls is "a lot" of draw calls for real-time framerates. But 5000 bricks is only one or two big lego models. If you model all of the modular houses and you just want to see them in realtime, that's 17,090 parts -- that's a lot of draw calls! One trick we can do to lower the cost of matrix transforms is to store our model view matrix in vertex attributes rather than in a uniform. Vertex attributes are very cheap to change (via glVertexAttrib4f) and it allows us to draw one brick many times with no uniform change (and thus all of that uniform work by the card gets skipped). If we draw one brick many times, we can avoid a VBO bind, avoid uniform change, and just alternate glVertexAttribute4fv, glDrawArrays repeat. This technique is sometimes called "immediate mode" instancing because we're using immediate mode to jam our instancing data down the pipe quickly. For X-Plane on OS X, immediate mode instancing is about 2x faster than the built-in uniform/matrix transforms. BrickSmith's new renderer code is built around a 24-float instance: a 4x4 matrix stored in 4 attributes, an RGBA current color, and an RGBA compliment color. One nice thing about using attributes to instance is that it makes using hardware instancing simple. With hardware instancing, we give the hardware an array of 24-float "instances" (e.g. the position/colors of a list of the same brick in many places) and the brick itself, and issue a single draw call; the hardware draws the brick mesh for each instance location. Hardware instancing is much faster than immediate mode instancing - YMMV but in X-Plane we see instancing running about 10x faster than immediate mode; X-Plane can draw over 100,000 individual "objects" when instancing is used - more than enough for our modular houses. To use instancing we put the instance data into a VBO and use glVertexAttribDivisor to tell OpenGL that we want some attributes (the instance data) to be used once per model, while the other data is once per vertex. For BrickSmith, the instance locations are GL_STREAM_DRAW - BrickSmith generates the list of bricks per frame as the renderer traverses the model. So the bricks themselves are static but their locations are on the fly. I chose this design because it was the simplest; BrickSmith has no pre-existing way to cache sets of brick layouts. At 24 floats, even a 100,000 brick model is only about 10 MB of data per frame - well within the range of what we can push to the card. If a part contains translucency, it goes in a special "sorted" bucket, which is drawn last, from back to front. The sorting costs CPU time, so we only do this when we identify a part with translucency. Parts with "stack complexity" (e.g. texturing) that need to be drawn in multiple draw calls go in another bucket, the "just draw it" bucket - they are sorted by part so that we can avoid changing VBOs a lot - changing VBOs takes driver time! When it comes time to draw the instancing bucket, we choose immediate mode or hardware instancing based on (1) whether the GPU has hardware instancing and (2) the number of instances; for very small number of instances, it's cheaper to push the attributes than to change the buffer bindings (which is necessary for hardware instancing). The exact cutoff will vary with app, but typically hardware pays for more than 3 instances. Note that all instanced parts are written into a single giant stream buffer. This lets us avoid mapping and unmapping the buffer over and over, and it lets us avoid having a huge number of small buffers. Generally fewer, larger VBOs are better - they're relatively expensive objects for the driver to manage; if your VBOs are less than one VM page, find a way to merge them. The new renderer often runs about 2x faster than the existing code, while providing sorted transparency, and it typically runs at significantly lower CPU. One case where it did not run faster was with Datsville - the Datsville model I have for testing is about 39,000 bricks, resulting in 125 million vertices. It runs on my 4870 at about 5 fps. In the old renderer, I would see 100% CPU and about 5 fps; with the new one, maybe 30-35% CPU and 5.1 fps. Why no more speed? It turns out that the total vertex capacity of the card is only about 500 million vertices/second, so the card is vertex bound. (This is quite rare for games.) When the model is partly off-screen, framerate increases significantly.